Sweet, sorrowful Prudence Dickenson has been promised to Mr. Isaac Wells, a handsome and wealthy gentleman with a limp and a mysterious past. Everyone in Alder Gulch claims to like him and that he is a good man, but Pru resents the fact that she has no choice in the matter. Her parents believe that the marriage will help free her from her sadness at her late husband’s passing in the war, and they also reason that it’s time for her children to have a new father. Only once she’s married to Isaac does she begin to realize that there’s something to be said for a marriage of convenience. When she sees how well that he interacts with her children, Prudence begins to realize that perhaps needing someone and loving someone aren’t so very different from each other after all. 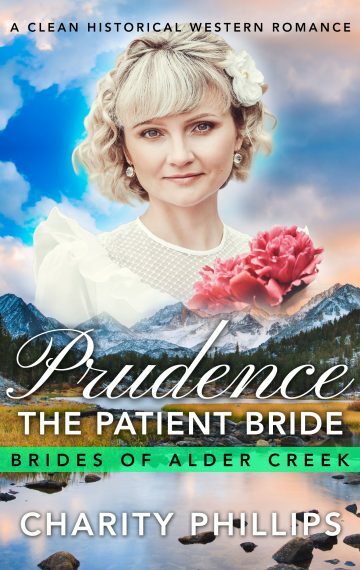 Prudence: The Patient Bride is a standalone 20,000 word clean historical Western romance.